Editor’s Note: A summary of the arguments made during the debate can be found here. Premier Christian philosopher Dr. WIlliam Lane Craig and outspoken atheist Christopher Hitchens will be debating the question “Does God Exist?” April 4th at Biola University. A live webcast of the event will be shown, and can be purchased here. What if the atheists are right? What if our Universe, the Earth, mankind, and you and I all exist by mere chance? What if, as Carl Sagan put it, “the Cosmos is all that is or ever was or ever will be,” and with nothing beyond the physical universe, Richard Dawkins was correct in stating “we are on our own in the universe…. humanity can expect no help from outside”? Point 1: If the Cosmos is all there is, then all that is will die. Is this really our great hope? That all that we know, all that we love, all that we are… may live on one day as nothing more than a faint and distant memory, drifting aimlessly through a cold, dead nothingness? If “the Cosmos is all that is or ever was or ever will be,” then what else IS there to hope for? Since there is no God, there is no outside force to intervene. We, the Earth, and the Universe will ultimately share the same fate… death. Point 2: If atheism is true, then man’s search for meaning is in vain. How essential is this search of meaning to man? Frankl summed up his findings by saying that “this striving to find a meaning in one’s life is the primary motivational force in man,” and yet if, as William Lane Craig points out in his book Reasonable Faith, “mankind is a doomed race in a dying universe,” what ultimate meaning could there be in the existence of anything or anyone? Perhaps one could say that they have “influenced others or affected the course of history,” but while their life “may be important relative to certain other events… what is the ultimate significance of any of these events? If all these events are meaningless, then what can be the ultimate significance of influencing any of them?” If there is no God, there can be no meaning. This is why many atheists compare man’s search for meaning to questions like “what is the meaning of a cup of coffee?” To distinguish ourselves in any ultimate sense from an inanimate object is nonsensical, we both simply exist, neither one having any ultimate reason for existing, and neither holding any more inherent value than the other, which brings me to my next point. Point 3: If there is no immortality and no ultimate moral authority, then all things are permitted. Humanist philosopher Richard Taylor points out in his book Ethics, Faith, and Reason that “to say that something is wrong because . . . it is forbidden by God, is . . . perfectly understandable to anyone who believes in a law-giving God. But to say that something is wrong . . . even though no God exists to forbid it, is not understandable. . . . The concept of moral obligation [is] unintelligible apart from the idea of God. The words remain but their meaning is gone.” The only way that something can be wrong in any real and objective sense, is if a God exists to declare it to be so. If there is no God, and we have no ultimate moral authority to turn to, then what possible right could any of us have to declare anyone or anything wrong? We simply exist, and prefer one thing or the other. Truly, there exists a more or less consistent set of moral laws that we all subscribe to (a point we will explore later), but with no binding moral authority, choosing to acknowledge and behave according to these rules is nothing more than a valueless fact. Ghandi chose to follow these rules, Hitler didn’t. Is Ghandi a better person for doing so? Only in the sense that the majority of our species have decided it to be so. Was Hitler wrong for killing six million Jews? Most would say yes, but what of the minority of people that would say no? If God does not exist, then moral judgment is nothing more than opinion. I said again, “I know these quotations from Lenin. But there is a difference. When you cut a piece of wood it feels nothing. But here you are dealing with human beings. Every beating produces pain and there are mothers who weep.” It was in vain. They are materialists. For them nothing besides matter exists and to them a man is like wood, like an eggshell. With this belief they sink to unthinkable depths of cruelty. The cruelty of atheism is hard to believe. When a man has no faith in the reward for good or the punishment of evil, there is no reason to be human. There is no restraint from the depths of evil that is in man. The Communist torturers often said, “There is no God, no hereafter, no punishment for evil. We can do what we wish.” I heard one torturer say, “I thank God, in whom I don’t believe, that I have lived to this hour when I can express all the evil in my heart.” He expressed it in unbelievable brutality and torture inflicted on prisoners. “You’ve got it right,” Father Paissi said. In her essay Existentialism and Dostoevsky, Katharena Eiermann summarized Ivan Karamazov’s contention as, “if there is no God, everything is permitted.” Wurmbrand’s atheistic torturers understood this tie between God, immortality, and morality, and with no outside entity to stop them in this life, they were left without any fear of punishment, and the result was seen in the 18 wounds to Wurmbrand’s neck, back and chest he showed to the U.S. Senate upon his return to America. If atheistic evangelist Richard Dawkins was right in declaring that belief in immortality was “dangerous nonsense,” and thus that there is no immortality and no supernatural creator, then are not all things (including the acts performed by these Communist torturers) permitted? Editor’s Note: Introduction to the VOR Series The Basics. You believe that the Bible is the word of God, that Jesus is the Son of God, and that only those who place their faith in Jesus will find salvation after death. As a Christian, you believe these propositions not because they make you feel good, but because you think that they are true. Before I point out some of the problems with these beliefs, I would like to acknowledge that there are many points on which you and I agree. We agree, for instance, that if one of us is right, the other is wrong. The Bible is either the word of God, or it isn’t. Either Jesus offers humanity the one, true path to salvation (John 14:6) or he does not. We agree that to be a true Christian is to believe all other faiths are mistaken, and profoundly so. If Christianity is correct, and I persist in my unbelief, I should expect to suffer the torments of hell. Worse still, I have persuaded others, and many close to me, to reject the very idea of God. They too will languish in “eternal fire” (Matthew 24:41). If the basic doctrine of Christianity is correct, I have misused my life in the worst conceivable way. I admit this without a single caveat. The fact that my continuous and public rejection of Christianity does not worry me in the least should suggest to you just how inadequate I think your reasons for being a Christian are. Sam Harris and the militant atheists of our day are not stupid. Neither are the Orthodox Jews, agnostics, theologically-liberal Christians, or the host of others who have openly rejected the message of the gospel. The burden of proof is on us, the disciples of Jesus, to tell the world His message, and prove that there is no reasonable response to that message other than to fall down and worship Him as Lord. The VOR series, The Basics, is my attempt at doing just that. Obviously, not everyone will believe what we have to say, no matter how much evidence we provide, and God is not someone that is to be analyzed and discussed as if He were a mere concept, or a hat-in-hand deity in desperate need of people to believe in Him, just waiting to answer every arrogant and haughty “intellectual” question we can come up with… but giving silly, illogical, or inadequate reasons for believing this remarkably radical and supernatural message we carry gives respect neither to the message itself, nor the people to whom we bring it. As Paul said, if Messiah is not raised, we are of all men most to be pitied, for we are giving people false hope, and giving up our lives for a lie. Let us then strive after the truth, wherever it may lead. For then, we will know the truth, and the truth shall set us free. When I debated atheist Christopher Hitchens recently, one of the eight arguments I offered for God’s existence was the creation of this supremely fine-tuned universe out of nothing. I spoke of the five main lines of scientific evidence—denoted by the acronym SURGE—that point to the definite beginning of the space-time continuum. They are: The Second Law of Thermodynamics, the Expanding Universe, the Radiation Afterglow from the Big Bang Explosion, the Great galaxy seeds in the Radiation Afterglow, and Einstein’s Theory of General Relativity. While I don’t have space to unpack this evidence here (see I Don’t Have Enough Faith to Be an Atheist), it all points to the fact that the universe began from literally nothing physical or temporal. Once there was no time, no space, and no matter and then it all banged into existence out of nothing with great precision. · personal because it made a choice to convert a state of nothing into something (impersonal forces don’t make choices). Those are the same attributes of the God of the Bible (which is one reason I believe in a the God of the Bible and not a god of mythology like Zeus). How did Hitchens respond to this evidence? Predictably, he said that I was “speculating”—that no one can get behind the Big Bang event. I say “predictably” because that’s exactly the response Dr. Jastrow said is common for atheists who have their own religion—the religion of science. Hitchens admits the evidence but ignores its implications in order to blindly maintain his own religious faith (watch the entire debate at CrossExamined.org here). How is it speculation to say that since all space, time, and matter were created that the cause must be spaceless, timeless and immaterial? That’s not speculation, but following the evidence where it leads. I wonder if Richard Dawkins, Christopher Hitchens, and Sam Harris will soon be willing to admit that “the rebirth is real”? Or does one need to witness the impact themselves, as this man has, in order to come face to face with reality? And as far as Africa is concerned, how will the spread of the hyper-prosperity gospel message affect the good testimony that Christianity has built there? Leave a comment below and share your opinion. Editor’s Note: In an effort to educate followers of Jesus regarding what is going on in the wider culture, we share news that we think the people of God should be aware of, from a Kingdom perspective. Unless otherwise stated, we make no endorsements of the links, media, organizations, or people we report on. Well, if it’s not very funny, then what does it have to offer? Nothing, really, except a chance for Maher and Charles to make a fast buck (glad I got my ticket for free). Maher is pitching this film as mavericky—telling the truth about religion that everyone else is afraid to address. But Religulous is nothing more than filthy, nudie, druggie, and obtusey. There is little to laugh at and nothing to learn (except maybe that if you quit being religulous you get to act like Caligulous). 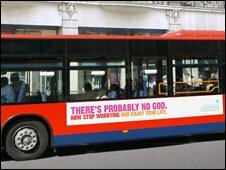 British atheists are planning to evangelize their disbelief on London’s buses by buying ads that proclaim “There is probably no God. Now stop worrying and enjoy your life.” Relevant news articles can be found at The Washington Post and BBC News. The campaign started as a response to bus advertisements that directed people to a Web site that declared that those who do not believe in God will spend “all eternity in torment in hell.” The initial goal was to raise 5,500 pounds, enough for 30 bus ads for 4 weeks, but so many donors came forward that they raised 80,000 pounds and expanded the project. Richard Dawkins, possibly the world’s most prominent and outspoken atheist, donated 5,500 pounds and said on his website: “This campaign to put alternative slogans on London buses will make people think — and thinking is anathema to religion.” Another donor left the comment “Spread the word, and consign this superstitious nonsense to the dustbin of history! America, are you listening?” on the group’s campaign website. The surprising thing about the project is not that it is being done, anyone that has followed the “new atheism” movement over the past few years expects to see atheism evangelized… what’s really interesting is its “positive” message. While the question of whether anything can truly be “positive” without God can be raised, its simple message of encouraging people to stop worrying and enjoy life is much less angry and mean-spirited than most of that which is propagated by the likes of Dawkins and his disciples. Though Dawkins’ jab at the stupidity of religion reassures me that he hasn’t changed his ways, and makes me wonder if he had little say in determining the slogan and would have wished the sign was a tad more aggressive and condescending. It is the broader task of Christian apologetics, including natural theology, to help create and sustain a cultural milieu in which the gospel can be heard as an intellectually viable option for thinking men and women. It thereby gives people the intellectual permission to believe when their hearts are moved.